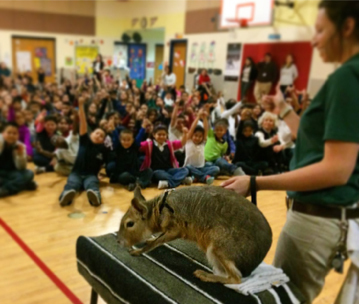 Bring the Zoo to your school with the Fort Worth Zoo’s Animal Outreach team! The Fort Worth Zoo’s Animal Outreach team will provide a program that is educational, entertaining and interactive. Outreach programs feature a wide variety of birds, mammals and reptiles. Your group members will learn all about animals found in their backyard and around the world. School programs are offered for a maximum of 350 students in elementary, middle and high schools in Tarrant County. Animal Outreach programs are also available for other events, such as school science nights, PTA events, senior center programming and scout meetings in Tarrant County. Outreach programming is available year-round. Remember to book early to assure your spot on our calendar for your future programs! Please call or email for available dates. Please note that Animal Outreach programs cannot take place in a home, business or outdoors. Animal Outreach programs are fully booked for the 2018-2019 school year. Bookings for the 2019-2020 school year will open soon. Animal Outreach programs are fully booked for Summer 2019. Evening programs must start at or before 7:30 p.m. Animal Outreach programs are available starting at 10 a.m.
Summer programming is offered on Tuesdays and Thursdays only.